Lawrence Robert (Larry) Smith, Jr., 71, of New Holland, Ohio was ushered into the arms of the Lord by the Holy Spirit while surrounded by his entire family on Saturday, March 30, 2019, at 12:40 p.m. at Mount Carmel West in Columbus where he had been a patient since Tuesday. Larry was born April 21, 1947, in Columbus, Ohio to Lawrence Robert and Mary Ellen Stout Smith. He was a 1965 graduate of Columbus South High School and moved to New Holland in 1986, from Columbus. Before his retirement, he was a tool and die maker; had served as lead man on an armored truck and was an NRA certified concealed handgun licensed instructor. 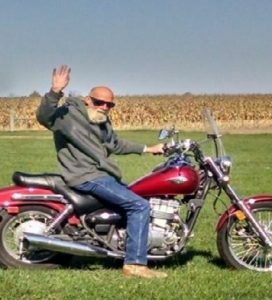 He was an avid motorcyclist; a proud member of the National Rifle Association; had formerly been a little league coach and an umpire for high school baseball. Larry was a devoted husband and father and loved his grandchildren, God and the Virgin Mary. He was preceded in death by his parents; a brother, David Smith and a sister, Charlyne Perkowski. He is survived by his wife, the former Janet Marie Rau whom he married June 1, 1974; six children and their spouses, Brent and Tanya Mauk of Bexley, Augustine (Auggie) and Kennie Smith of Amanda, Josh Smith of New Holland, Sarah and Daniel Jewell of Jeffersonville, Becky Smith of Mt. Sterling, and Willy and Elizabeth Smith of South Solon; nine grandchildren, Austin, Noah, Timothy, Peter, Estelle, Henry (Pound Cake) Smith and Matthew, Sarah and Justin Mauk and a sister, Eileen Smith of Columbus. The funeral will be Wednesday, April 3, 2019, at 11 a.m. at the Kirkpatrick Funeral Home in New Holland with family friend Tom Mitchell officiating. Burial will follow in the New Holland Cemetery. Friends may call at the funeral home in New Holland Tuesday from 4-8 p.m. In lieu of flowers, memorial contributions may be made to Heartland Hospice, P.O. Box 10086, Toledo, Ohio 43633-0086.